Samsung is updating Galaxy Note 7 smartphones in Europe that are still in use despite a fire risk, to prevent them being charged past 30%. The update aims to encourage the few owners who have not yet returned the faulty devices to hand them in. Samsung issued a global recall for the Galaxy Note 7 in September following complaints about exploding batteries. It estimates that in Europe about 10% of Note 7 owners have yet to return their devices. In a statement, Samsung, which plans to begin the changes on 15 December, said the update it issued in September that limited charging capacity to 60% "helped to drive a high rate of return". "This new battery software update is specifically designed to reinforce to the remaining minority of customers to immediately replace their device," it said. Customers can swap their phones via local replacement programmes, it added. Reports suggest Samsung is taking different steps in other regions to encourage people to turn in their phones. In Canada, an update reportedly turns off all the radio communications on a phone, including phone, wi-fi and bluetooth, rendering it useless. In the US, Samsung said it would issue an update on 19 December that would stop devices charging and "eliminate their ability to work as mobile devices". It said about 93% of all faulty phones had been returned in the US. Verizon has said it will not apply the update because of safety concerns for people who have no other phone. "We do not want to make it impossible to contact family, first responders or medical professionals in an emergency situation," it said in a statement shared with tech news site The Verge. After the battery debacle, Samsung stopped global production of the Note 7. 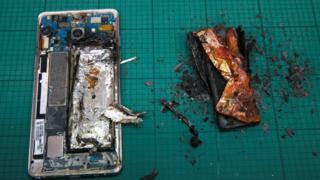 Reports of fires led to Samsung issuing a warning and asking owners to turn off their devices and hand them in. Profits at the electronic giant plunged following the recall. In late October Samsung announced that its operating profit for the three months between July and September was 30% down on the same period in 2015.